Youth Camp in Kenya Changes Lives! At the beginning of each year for the past ten years, some of our church worship leaders, Ernest and Readda Begay, have been sponsoring the Gospel Music Celebration at Red Rock State Park in Gallup, New Mexico. This is a free event for all surrounding communities of the Navajo Nation, with more than twenty worship teams coming together to minister in music, songs and testimonies, and giving praise to God. The event starts in the morning of a weekend and goes on all day until late in the night, with full capacity of a crowd of 900, and there were times people had to wait in line outside just to get in. Door prizes are drawn in between musical groups. Later in the evening, the guest speaker brings forth the Word of God, and there is an altar call for salvation, prayer of faith for the sick and deliverances. We've never failed to see great and mighty acts of God in this event. This is the event where all those who have been look forward to the following year. This year Dave Duell came as our guest. 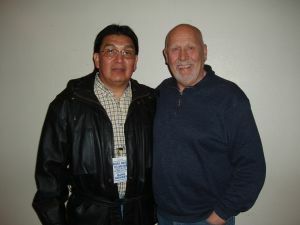 Dave has ministered at the "Jesus for the Navajo Nation" Revival at Ganado, Arizona, for the past nine years, in the summer where the heat is at its peak, and now he came in January when the weather is at its coldest. In spite of extreme weather conditions, the message and the anointing of Dave is still at its best. The "chop" is sharper than ever before. The message of "Identity in Christ and Righteousness" brought renewal to those who have heard it before, a revelation to those who have never heard it, and good news to those who heard it for the first time. The results of the messages are that sixty young souls came forth for salvation. Some of you may know that when Dave does an altar call for salvation, you don't only come for salvation, but he delivers the whole package � salvation, "chop" for deliverance, and filling of the Holy Ghost! For the "chosen frozen" Christians that were still in their seats, he took a walk to where they were, all the way to the back of the grand stand. By now he is firing Holy Ghost from the hip until not one "religious spirit" is standing or sitting in that auditorium. If they were standing, they are now lying on the floor. If they were sitting, they slid off the chair. Laughter, shouting and rejoicing broke out. Now Gospel Music Celebration is at its wildest moment! The next day there was such a freedom in the Spirit in that auditorium. Some of the people were in awe because they have never seen such explosive power of God as demonstrated by Dave. We, the church, know what to expect every time he comes to town � that is, the new things. Isaiah 43:18 says, "Do not remember the former things, nor consider the things of the old." That�s because God always has something new for His people (if we will let Him). This doesn't mean new doctrine or teachings but to bring out the ancient acts of God, which many in the church don't know or even believe. If we dare to believe, He'll do it again for His Glory. We, the pastors of Ganado Glory Temple Ministries, want to thank Dave and Bonnie for their obedience to the Lord for coming to the Navajo Nation and making an impact on our people, the land and its government. We'll be looking forward to the next meeting. Sammy and Sandy Begay have pastored Gandado Glory Temple in Ganado, Arizona, USA, Navajo Nation since 1996. Their desire to evangelize their people and spread God�s love among other Native American tribes runs deep in their hearts.